Half of U.S. states don't require home-school students to be vaccinated against diseases that include measles, chickenpox and hepatitis B, according to an organization that advocates greater oversight of home schooling. 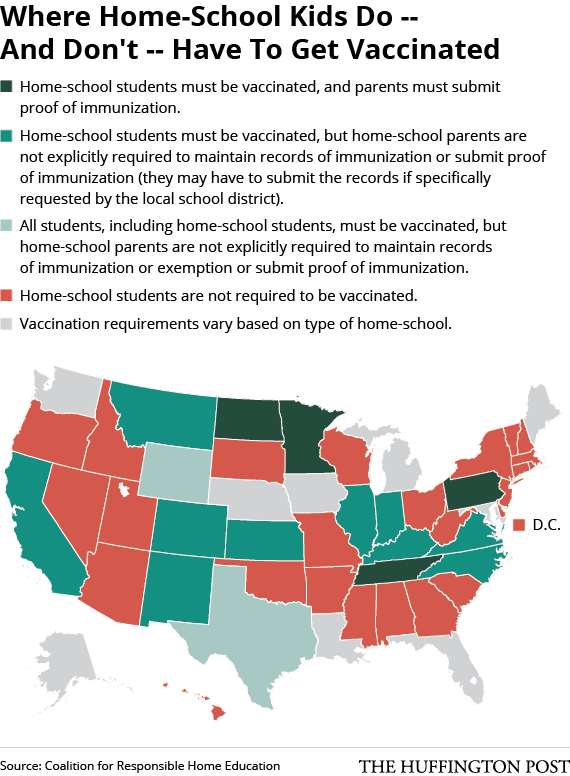 While public schools require students to get a number of vaccinations before entering kindergarten, there's no mandate for home-schooled children in 25 states, according to the Coalition for Responsible Home Education. About 3 percent of the U.S. school-age population was home-schooled in 2011-2012, according to the U.S. Education Department. Amid a recent measles outbreak that has infected more than 100 people in 15 states, politicians, public health officials and researchers have called on parents to vaccinate their children. Forty-eight states require public school students to get vaccinations before entering kindergarten, allowing exemptions based on medical circumstances, and for religious or philosophical reasons. In Mississippi and West Virginia, public school students must be vaccinated unless they have medical reasons. But even in states with strict vaccination rules, home-school students can be free from immunization requirements. Health authorities say vaccinations are a public health necessity. As a result, states’ lack of regulation over home-school students may be a problem. Rachel Coleman, executive director of Coalition for Responsible Home Education, a 2013 Texas measles outbreak that began with unvaccinated home-school students. “Home-school students sort of cluster together,” facilitating the spread of disease, said Coleman.